Spoiler Alert! I am giving away part of the plot, so read at your own risk! 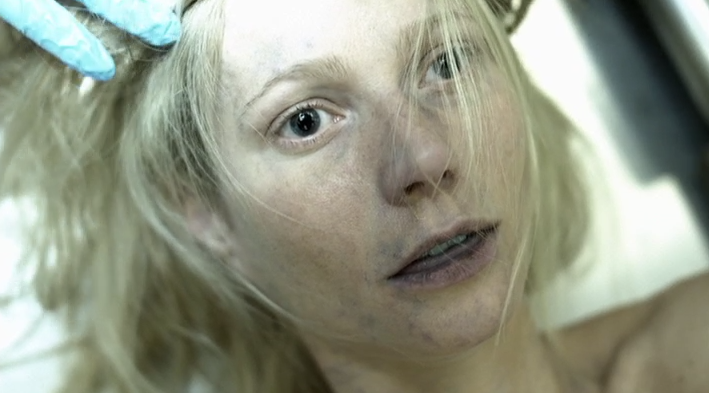 Gwyneth Paltrow in the autopsy scene for Contagion, right before they remove take a look at her brain. Don't worry, they only show a little scalp. The most recent movie in my Netflix queue is Contagion. The movie is about a new virus that spreads like wild-fire to decimate the world population. I was having such a great day that I wanted to watch something light and uplifting. Because Contagion was about a virus, I was hopping I would see some boils, lesions and other external signs of the disease. Unfortunately all I saw was signs of the flu (basic sick, distressed makeup). As a makeup artist, I found it a little disappointing. Maybe they spent so much money on all the big name talent in the movie, that there was no budget left for makeup? They did spend a little bit of money cutting open Gwyneth Paltrow’s head. Again it was disappointing because they didn’t bother to show more than her scalp being peeled back. Plus, Paltrow’s cheeks seem a bit rosy for a corpse (love the tongue protruding slightly… nice touch). Maybe they wanted to keep the makeup low-key and focus on the idea of disease? Maybe somethings are better left unseen? I don’t know. I am just throwing something out there. I always thought of graffiti artist as very abstract and edgy, so it’s nice to be compared to someone artsy. Who knew I was so hip? 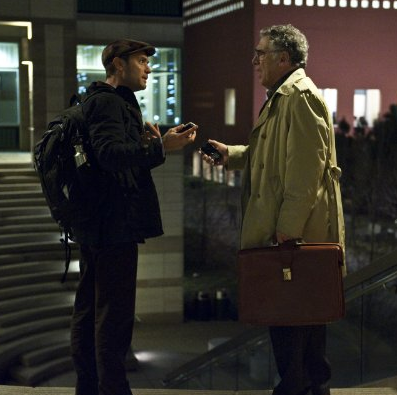 Further into the movie they call Jude Law (the blogger) a freelance journalist. I guess a title all depends on your point of view. Of course later he gets arrested for lying and inciting a riot, but that’s besides the point. What do you think of the makeup in this movie? I am sure the makeup artists on this movie were just giving the director what he requested. Directors have final say over these things. How do you feel about the makeup? Do you feel they went cheap? Or that the movie didn’t need any extra punch? My opinion: The sick don’t need to vomit blood, but give the infected something interesting… like a rash at the very least. I’m just saying. Elliot Gould tells Jude Law "A blog isn't writing. It's graffiti with punctuation"